"DeVinney Plumbing has been my "go to" for the plumbing / renovation needs for my rental property for over ten years. If I could, I'd give them ten stars! They were referred to me by a long-time, trusted friend. Don and his crew are trustworthy, professional, reliable, friendly, and reasonable. They get straight to the heart of the problem and explain all options--best, cheapest, etc. They even help with design questions. They keep me informed throughout the process, their work is very high quality, and I've never had a repeat call once they've completed a job. Since I'm rarely in the area, I'm thankful that a phone call to Don & Anita handles it." Are you looking for a professional plumber? 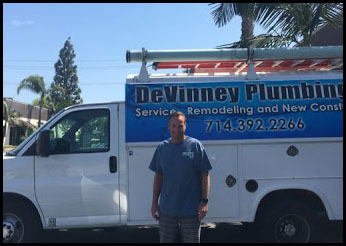 DeVinney Plumbing, Inc. is a family owned business located in Huntington Beach, California. DeVinney Plumbing, Inc. is a licensed, insured and bonded company that provides top quality plumbing services for an affordable price to Huntington Beach and the Orange County area. We have done plumbing work in residences, hotels, schools, apartment complexes, health clubs, restaurants and much more. We specialize in the hard problems that others may shy away from such as underground water leaks, gas leaks and slab leaks. We also cover the basics such as drain cleaning, leaky faucets, and many facets of new construction, remodeling, water filters and softeners, water heaters, tankless water heaters, to name a few, and we take pride in ensuring our customers are pleased with our services. Give the experts at DeVinney Plumbing, Inc. a call today.